One of the highlights of our road trip from South Africa to Tanzania in 2010 was spending a couple of days camping in Ruaha National Park in central Tanzania. We found Ruaha quite spectacular  at least the tiny portion we saw  with its majestic baobabs, rocky outcrops, distant hills and, of course, the Great Ruaha River. The wildlife was not as impressive as the scenery, but we did see plenty of elephants, a huge herd of buffalo, a variety of antelope, giraffe, zebra, plus interesting birds one doesn't see in southern Africa. 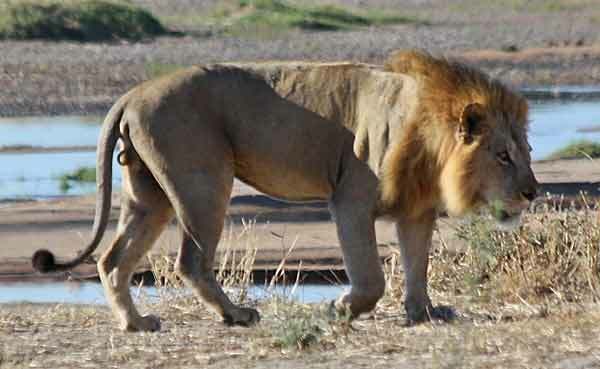 (See Ruaha Safari Pictures for pics from this visit). 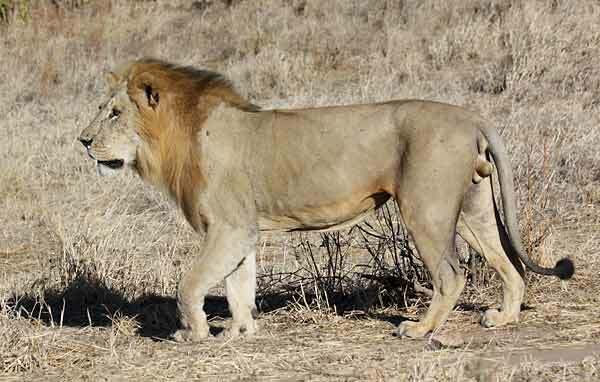 On our first morning, near camp, we found a big male lion on the side of the road. He then crossed the road and wandered down towards the river (below). Our campsite, on a bend of the Ruaha River, was shady and comfortable, while we were pleasantly surprised by the state of the ablutions. Tanzania's parks are notoriously expensive but the facilities are certainly not comensurate with what you pay, so it was a surprise to find clean showers and flush toilets that actually worked. But camping in Ruaha was more than a memorable safari experience, it was a strong reminder that when you're in the bush, you're sharing the habitat with the resident wildlife, something one tends to forget at times. Our reminder came in the form of a visit from the lion we'd seen a little earlier. Fortunately we'd all left to go on game drives in our separate vehicles by the time he took a morning stroll past our tents. The picture below shows the lion with our tents behind him (the brown tent is partially hidden by his head), and was taken by two of our travel companions, Peter and Rhona Carte, who were the last to leave on their drive. Although I've stayed in camps and lodges where the trackers have pointed out leopard spoor in camp, apparently left there during the night by these stealthy big cats, it's not quite the same as witnessing a large lion near your tent in broad daylight. The lesson, certainly for our group, was that one should never drop one's guard when staying in the wild. On another day or another place, it's quite possible that one of our party might have opted to sleep in rather than go for a drive. Imagine walking out of your tent, heading sleepily for the kitchen area to make some coffee, then looking up to see a rather large carnivore strolling around nearby. Oh shite! In most cases the lion would probably get as big a fright as you and dash off, but if it was hungry or agitated and you turned and ran, then chances are you'd be flattened in a couple of strides by a mighty paw. 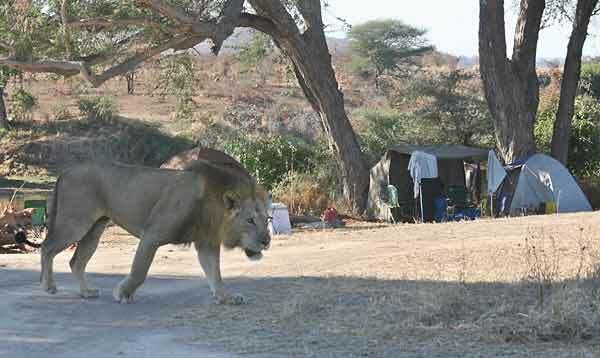 So, don't sleep in when you could be on a game drive and, if you do, be very alert when you emerge alone from your tent. You never know who'll be visiting your camp! Ruaha is vast, covering 10,300 sq km (3,980 sq miles) of semi-arid bush country characteristic of central Tanzania. The park's lifeblood is the Great Ruaha River, which flows along the eastern boundary in a heavy torrent during the height of the rains, then dwindles to a scattering of irregular pools during the dry months. As would be expected in a wilderness area of this size, the wildlife is plentiful, with plains game sustaining large populations of predators, including big lion prides, cheetah, leopard, African wild dog, and spotted hyena. The elephant population is the largest of any Tanzanian national park, despite heavy losses due to poaching in the 1980s, with an estimated 12,000 elephants migrating through the greater Ruaha ecosystem. The unusually high diversity of antelope in the park is a function of its location, which is transitional to the acacia savannah of East Africa and the miombo woodland belt of Southern Africa. Grants gazelle and lesser kudu occur here at the very south of their range, alongside the miombo-associated sable and roan antelope, and one of East Africas largest populations of greater kudu, the park emblem. A similar duality is noted in the checklist of 450 birds. The likes of crested barbet  an attractive yellow-and-black bird whose persistent trilling is a characteristic sound of the southern bush  occur in Ruaha alongside central Tanzanian endemics such as the rare Ruaha (or Tanzanian) redbilled hornbill (Tockus ruahae), the yellow-collared lovebird and ashy starling. Central Tanzania, 128km (80 miles) west of Iringa. Scheduled and/or charter flights from Dar es Salaam, Selous, Serengeti, Arusha, Iringa and Mbeya. Year-round road access through Iringa from Dar es Salaam (about 10 hours) via Mikumi or from Arusha via Dodoma.